Gary Deol (l), grower and co-owner. The Cowichan Valley’s newest winery, Deol Estate Winery, opened quietly last Saturday. It is the seventh British Columbia winery operated by an East Indian family; and there are others under development. This is the classic story of immigrants who, after doing hard scrabble work when they arrived in British Columbia, are now part of the main stream of the province’s vibrant wine industry. By a remarkable coincidence, Deol is the third winery owned by East Indian immigrants to open this year. Kalala Organic Estate Winery opened in July in Westbank. Chandra Estate Winery near Oliver began selling wines this summer but plans a grand opening next spring. Already thriving are Westbank’s Mt. Boucherie Estate Winery (which opened in 2001); Desert Hills Estate Winery (2003) and Orchard Hill Estate Cidery (2007), both near Oliver; and Richmond’s Sanduz Estate Winery (2006). Surgit Deol’s family immigrated to Canada from the Punjab in 1980, and spent a few years in the Cowichan Valley before moving to Oliver in 1982. As Surgit’s son, Gary remembers, there were perhaps four East Indian families there at the time. Today, he estimates that 300 live there and a number of adapted their Punjabi farming skills to growing grapes. In a growing number of examples, this has progressed to opening well-regarded wineries. In the 1980s, the Deols, in addition to operating their own orchard, worked in some of the leading vineyards in the south Okanagan. When the searing Okanagan sun caused some health problems, they decided to return to the more moderate Cowichan Valley. In 1999, the family bought a former dairy farm north of Duncan and, starting the following year, developed a 23-acre vineyard (Gamay, Maréchal Foch, Pinot Gris, Pinot Noir, Chardonnay and a few odds and sods). They have been selling grapes to other Vancouver Island but in 2007, looking to extract more value from their farm, they kept back enough fruit to make 1,600 cases of wine. The cool, wet 2007 vintage on Vancouver Island challenged vineyards trying to ripen wine grapes. The winery owners turned this to an advantage. Rather than make insipid reds from the Gamay and the Pinot Noir, they made a refreshing rosé with the Gamay and a crisp white wine with the Pinot Noir. They froze the Chardonnay grapes and then made an Oregon-style icewine. Maréchal Foch, the workhorse of Vancouver Island, seldom fails to ripen; so the winery was able to make a full-bodied, barrel-aged red. All the wines are available currently in a tasting room that the Deol family has built in a renovated century-old farm house. Like the family and like the wines, it has a warm, unpretentious ambiance. Lawrence and Sharon Herder (left), the owners of Herder Winery & Vineyards, have moved their Similkameen Valley winery to a grand location with a tasting room that commands the most spectacular valley view of any winery. They now operate from a large and beautifully remodelled three-storey house set high against a cliff on the north side of the valley, overlooking Keremeos. The tasting room has an absolutely baronial look to it, a far cry from the sensibly modest little wine shop in their original winery near Cawston. Perhaps the elegance of the tasting room adds to the experience, but the current Herder releases taste really fine. That is especially so of the $20 white called Three Sisters, a blend of Chardonnay (46%), Pinot Gris (36%), Gewurztraminer (11%) and Viognier (7%). This is a complex and satisfying blend, starting with aromas of melons and citrus. The flavours are tropical - guava, tangerine, papaya - with a touch of minerals in the backbone. The tangy lingering finish has a hint of green apples. The moderate 12.8% alcohol contributes to the refreshing personality of Three Sisters. Only 250 cases are available. 90 points. If you decide to visit, the new tasting room is at 2582 Upper Bench Road, Keremeos. Telephone 250-499-4495. Open daily from 10 to 6. Hillside Cellars winemaker Kelly Symonds is moving to California Cult Classics, North Vancouver's super-premium do-it-yourself winery. If the career move seems surprising, it actually makes sense: she will be making wines some of the finest grapes from California, an opportunity not available to her unless she moved there. California Cult pays $6,000 a ton and up to buy grapes from the same vineyards, including Napa's Beckstoffer Vineyards, that grow for a number of the cult wineries in Napa. "Kelly and I share the same vantage point on winemaking," says Frank Gigliotti, who founded California Cult Classics in 2005. "She loves those big booming California wines that we make here." A self-taught winemaker with 23 vintages behind him, Gigliotti recruited a professional so that he has more time to market his business. "I didn't ask her to join us to become a cellar rat," he says. Located in an anonymous industrial mall in North Vancouver, California Cult operates under the stringent U-Vin license. Producers under that license must ensure that their customers take a role in making the wine - wine made for personal consumption and not for sale. California Cult has about 300 members who subscribe for wine by the barrel (or by quarter barrels). The members participate in various stages of making the wine, from adding the yeast to bottling the finished wine; and they take possession of the wine immediately on bottling it. But there is plenty of room for a hands-on winemaker to help the members produce wines of professional quality. "She can bring a lot of skills to us that we don't have," Gigliotti says. During California Cult's first year, the professional in the cellar was Ray Signorello, the West Vancouver resident with a couple of Napa wineries. Symonds is a rising star in British Columbia winemaking. A dentist's daughter, she was born in Abbotsford in 1977. She was studying science at university when her mother gave her a wine appreciation course. After a summer job at Sumac Ridge’s wine shop, she got a bachelor’s degree in enology from the University of Adelaide in Australia. 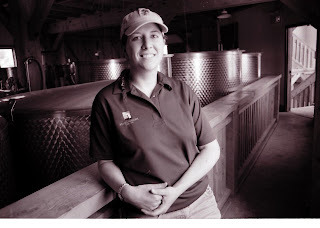 In February, 2003, a few months after graduating, she became the cellarmaster at Hillside and, after taking increasing responsibility from Hillside’s consultant, became winemaker in 2005. Hillside is a Naramata Bench winery that produces about 10,000 cases a year. "We make about a quarter of that," Gigliotti says. Kelly is helping California Cult make the Chardonnay and Pinot Noir from grapes that arrived from California on September 11. She will handle the 2008 vintage for Hillside, however, and will help the winery find a replacement. At least two Canadian liquor boards, including the mammoth Liquor Control Board of Ontario, have recently taken a tough line with wineries that have shipped wine across provincial borders to private buyers. It has been illegal since 1928 to ship wine across provincial borders to any recipient but a provincial liquor board. In the past, enforcement has been spotty unless the infractions were obvious. Some years ago, for example, a strike at the Saskatchewan Liquor Board caused residents to shop in liquor stores in neighbouring provinces. In one instance, unionized employees stationed themselves in Manitoba Liquor Commission parking lots to note down Saskatchewan license plates. These were passed on to the police in Saskatchewan so that they could stop cars returning from Manitoba and seize liquor. The issue of trans-border liquor sales is on the regulatory radar screen this time because most wineries now sell through their websites. While they are not supposed to ship directly to purchasers in other provinces, some have been doing it. Now they are being told to stop. The Red Rooster Winery in the Okanagan got a stern warning from the Manitoba Liquor Commission. As a result, Andrew Peller Ltd. has forbidden all of its British Columbia wineries from filling out-of-province orders. Another Okanagan winery has had its knuckles rapped by the Ontario board and was threatened with a loss of its listings in Ontario. The intent of the 1928 legislation, the Importation of Intoxicating Liquors Act, very likely was control. Canadian provinces emerged from Prohibition, which began in 1917 in Canada, by setting up liquor control boards. This was a way of getting the temperance movement off the backs of governments. Today, the ban on inter-provincial shipment of wine and other spirits through private channels is all about tax collection. Liquor boards insist on getting their mark-ups from every bottle sold. As they see it, when a winery ships directly to private buyers in other jurisdictions, the winery is evading tax. The Canadian Vintners Association has been pushing Ottawa to lift the ban. The CVA was optimistic last fall when the federal government said it its throne speech that it intended to remove barriers to interprovincial trade. How many times have we heard that promise? Once again, that has turned out to be an empty promise. Now, it seems that liquor boards are making sure the door is slammed shut. The irony is that the United States Supreme Court tore down just such barriers three years ago. Most American wineries now can ship directly across that country. It would be of great benefit to Canadian wineries if they were allowed to fulfill all orders that come to them from private purchasers. It would allow consumers to buy wines from other regions that are simply not available in most provincial liquor stores. Try buying a Quebec wine or a Nova Scotia wine at your local liquor monopoly! Don’t hold your breathe. It may not happen in our lifetimes.